Hillary Clinton’s Latino outreach director is a former illegal immigrant and beneficiary of Obama administration amnesty who still cannot vote in an election. The Los Angeles Times reported glowingly Friday on 27-year old Clinton campaign official Lorella Praeli, who emigrated illegally to the United States from Peru, reportedly for “medical treatment.” She got a green card three years ago but her mother continues to enjoy the American standard of living as a criminal within U.S. borders. Praeli is not a citizen, and thus must reach out to Hispanics who are already citizens or could become citizens before the election. Praeli got her start in politics in elementary school by printing out her classmates’ name-calling (she claims they called her “peg leg” for her prosthetic leg and “border hopper”) and handing them over to “school police,” according to the Times. 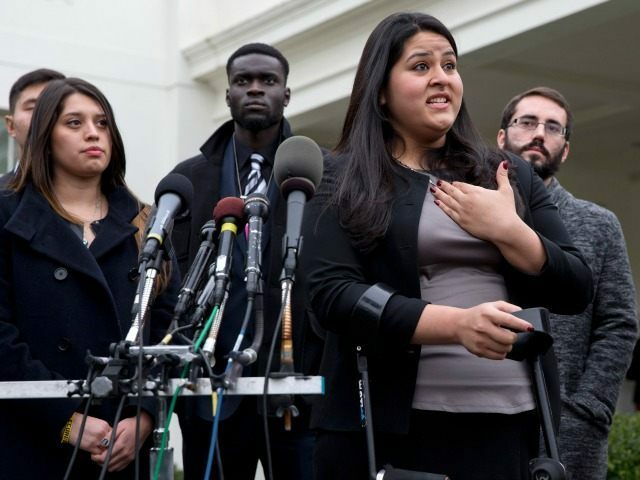 “We wanted to create a moral dilemma in the country so when people say ‘undocumented,’ they know who they’re talking about,” said Praeli about her youthful activism on behalf of amnesty for illegal immigrants. Praeli’s contributions to the Clinton campaign include encouraging staffers to tweet negatively about Donald Trump, according to the Times article. Clinton noted in this week’s Las Vegas debate that she has met with young so-called illegal immigrant “DREAMers.” She publicly met with some DREAMers at a Las Vegas high school back in May.